Glaucoma is a group of diseases that damage the eye’s optic nerve, resulting in vision loss and blindness. Glaucoma occurs when the normal fluid pressure inside the eyes slowly rises. Often called ‘the sneaky thief of sight’, Glaucoma has no warning signs and is one of the leading causes of blindness. 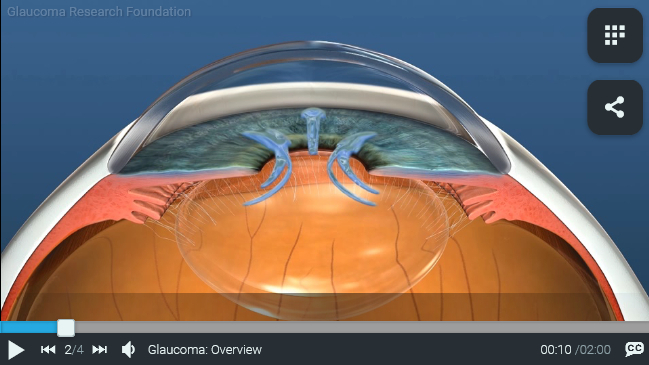 Click the video below for an overview on Glaucoma. There are usually no symptoms in the early stages of Glaucoma. Early diagnosis is extremely important and with early treatment, you can often protect your eyes against serious vision loss.Without treatment, people with Glaucoma will continue to slowly lose their peripheral vision, and eventually their central vision as well. Vision lost to Glaucoma cannot be recovered. The two main types of Glaucoma are Primary Open-angle Glaucoma, and Angle-closure Glaucoma. Both are caused by an increase of intraocular pressure (IOP), or pressure inside the eye. Open-angle Glaucoma is the most common form of Glaucoma. This type of Glaucoma develops slowly, and you may not notice any loss of sight for many years. If caught early and treated, this type of Glaucoma responds well to a regimen of medications. Angle-closure Glaucoma, which is also called Acute Glaucoma, can occur if your iris is too narrow and closed. If the pupil gets bigger than the iris can accommodate, or if the pupil’s size changes too fast, that causes the iris’s outer edge to bunch up and block the drainage canals. As with Open-angle Glaucoma, blocked drainage canals cause the IOP to increase rapidly, which in turn damages the optic nerve. Symptoms include severe pain and nausea, as well as redness of the eye and blurred vision. If you have these symptoms, you need to seek treatment immediately. Treatments may include medication, most commonly prescription eye drops, or surgery, such as Laser Trabeculoplasty to lower the pressure in the eye and prevent further damage to the optic nerve. There are many different types of eye drops that lower your IOP and prevent additional damage to the optic nerve. Your doctor will decide which ones are best for your type of Glaucoma. Studies show that laser surgery is very good at reducing the pressure in some patients. It’s effects can wear off over time however, and your doctor may suggest further treatment. While there is no cure as yet for Glaucoma, early diagnosis and continuing treatment can preserve eyesight. At Advanced Eye Care, we are committed to ensuring the health of your eyes. Our board certified ophthalmologists closely monitor Glaucoma problems when they arise, and provide treatment as needed. Glaucoma care and treatment options include topical eye drop medications, laser treatments and surgery.